A Connecticut Cafe Provides Jobs For Adults With Disabilities After the age of 21, adults with intellectual disabilities are aged out of programs designed to help them. A cafe in Connecticut was recently opened to provide employment and a gathering place. 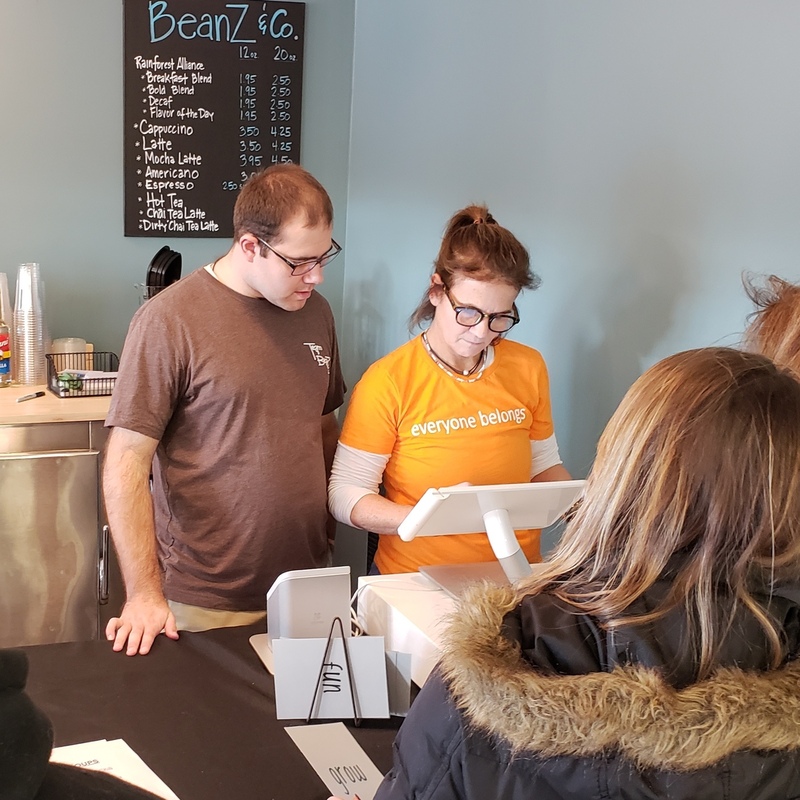 Kim Morrison, (right) co-owner of Beanz & Co. Cafe in Avon, Conn., with her employee, Nick Sinacori, as they serve customers during their opening week. The money won't be going to Traceski or Sinacori, or anyone else at the cafe. It will be donated to a nonprofit that the employees will choose at the end of the month. A few moments later, a customer's latte arrived in a sleeved paper cup, filled to the brim with foam. Sinacori then explained another aspect of this new coffee shop that's a little different — the system to identify customers who are waiting for an order uses words like "fun" and "inspire," written onto laminated cards that customers stick on their table. "Oh, that's awesome, I love that system," said customer Deb Cervice. "It's very positive," Traceski replied. "Very positive." That positivity is a running theme at BeanZ, a cafe in central Connecticut that hires young adults with physical and intellectual disabilities. It's evident on the cue cards, on the tip jar, and even on their uniform shirts, which read "Everyone Belongs." There's no shortage of jobs. There's a shortage of employers willing to hire people with intellectual disabilities. There's just not enough awareness about the value that hiring people with disabilities can bring to a company. Traceski and Sinacori have had jobs before, but this one is different. That's because BeanZ is trying to be more than just a cafe, said co-owner Kim Morrison. "Having jobs for this community is super important," Morrison said. "I think another part — after the age of 21, after transitioning out of school — is the socialization, and having opportunities to get together with friends." "We're trying to make this like a hangout kind of place, where you can watch TV, or you can come here with your friends, or your family, you know, and make it a good time," Traceski said. Young adults with disabilities face a daunting challenge after their 21st birthday. That's because federally mandated services in many cases simply stop. So in addition to losing out on programs, they also lose chances to hang with friends. 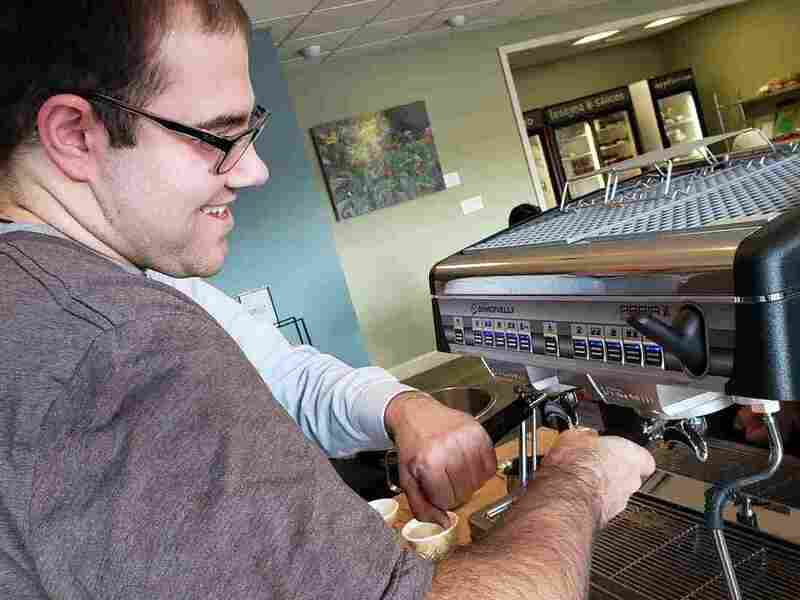 Nick Sinacori, 23, learns how to operate an espresso machine at BeanZ & Co. Cafe in Avon, Conn. The cafe was opened with the goal of hiring adults with intellectual disabilities. "There's no shortage of jobs," Morris said. "There's a shortage of employers willing to hire people with intellectual disabilities. There's just not enough awareness about the value that hiring people with disabilities can bring to a company." So Kim Morrison and Noelle Alix started BeanZ. They understand that most families can't afford to open a business so their kids could get a job. But their hope is that, if they hire young adults with disabilities, other businesses would do the same. "Just hire one adult with a disability, and that is a win for our community," Morrison said. "So that is another goal of ours, is to have that happen." "I think every employer that does have an inclusive workforce will say their company culture is the better for it," Alix said. "It's a growing process," Morrison said. "We're going to go slow and figure it out, so we set everybody up for success — including myself." BeanZ & Co joins a growing number of companies that are trying to do more than just offer a service — they want to catalyze change and to change people's minds about what it means to be differently-abled, another way of looking at disability.